The Union Cabinet, on Friday, approved a centrally sponsored scheme for providing Minimum Support Price (MSP) to forest dwellers for minor forest produce (MFP) on lines of support price for agricultural products. The Central government plans to spend Rs. 967.28 crore while states would contribute Rs. 249.50 crore “to ensure fair and remunerative price to MFP gatherers”, the decision stated. The scheme, however, does not apply to MFPs like bamboo and tendu leaves, trade of which has been monopolised by the state governments. By not announcing support prices for bamboo and tendu, the government has effectively lost the opportunity to uplift the economic status of tribals, as promised by Forest Rights Act (FRA) of 2006. Bamboo and tendu leaves are the two most lucrative forest produce; their trade forms a major part of a states’ revenue. For instance, the Madhya Pradesh government alone earns over Rs 200 crore per year from the sale of tendu leaves. Madhya Pradesh, Chhattisgarh, Andhra Pradesh, Odisha and Maharashtra together earn up to Rs 82 crore a year from bamboo. The states have monopoly over tendu leaves and bamboo, either directly or through its corporations. Contractors buy tendu leaves from government in return of royalty, while forest dwellers earn daily wages for collecting the leaves. A strong lobby of contractors, in collusion with bureaucrats and beedi-makers, has kept royalty and wage rates of tendu leaves much lower than the market price. The Forest Rights Act rendered this practice of states illegal by recognising the right of forest dwellers to own, manage and sell minor forest produce. An estimated 100 million forest dwellers depend on MFP for food, shelter, medicines and cash income. However, the MFP rights have not been given to forest dwellers in the country except for a few places in Maharshtra and Odisha. Even in these places, the states, especially forest departments, have been resisting relinquishing the monopoly over the trade of bamboo and tendu leaves and the forest dwellers have been struggling to win their rights to trade in the produce (see Bamboo rising). In their defence, the states argue that they have a well-stablished system of procurement of MFP which will protect the interests of forest dwellers. 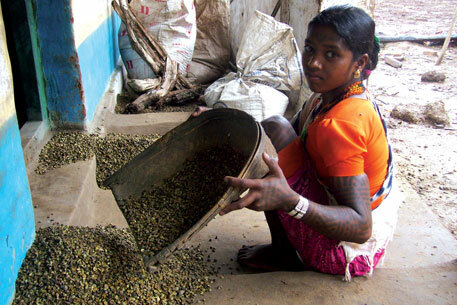 In the open market the tribals will be exploited by the traders, claim the states. To address this problem, the idea of providing MSP for forest produce on the lines of support price for agriculture produce was mooted by the Central government in 2010. A committee under the ministry of Panchayati Raj was constituted to figure out the mechanism which recommended MSP for 13 MFPs including tendu leaves and bamboo. The then environment minister, Jairam Ramesh, had pushed the case with the Planning Commission for initiating the scheme for the 13 MFPs. Prime Minister Manmohan Singh, in his Independence Day speech last year, had announced that a scheme would be formulated to ensure fair and remunerative price to MFP gatherers. The Cabinet decision mentioned bamboo and tendu leaves along with other MFPs like karanj, mahua seed, sal leaf, sal seed, lac, chironjee, wild honey, myrobalan, tamarind, and gums (gum karaya), in the list of 12 MFPs for which the MSP scheme has finally been approved. But it has specified that the scheme will apply to only non-nationalised (non-monopolised) MFPs in each state, effectively leaving out tendu and bamboo. As per the scheme, TRIFED will be the nodal agency. Every year, MSP will be decided on the basis of production, market value, value addition and the labour cost. The gatherers will be free to sell other non-nationalised MFPs in the open market if they get a better price. If the market price goes down, the government agencies will procure the MFP on the MSP. Profit made by the procuring agency, if any, will be ploughed back to the gatherers while loss in the trade will be absorbed by the government. This stand of the ministry seems surprising as the Union minister of tribal affairs had openly criticised the states’ monopoly of trade over MFPs in the past. He termed it as illegal in the wake of FRA. Former bureaucrat N C Saxena, who headed a government panel that reviewed the implementation of FRA in 2010, however, sees a problem in the implementation of the act. “The main problem is that in most of the places people have not got the right over MFP. Hence, in such areas there is no question of illegality in state monopolising the trade,” he said. Saxena, though, welcomed the government move to provide MSP for non- nationalised MFP's. He cautioned this might induce state governments to monopolise more and more MFPs. “For now it is wise not to keep tendu leaf trade out of the government control because it needs lot of working capital to collect, process and trade in tendu leaves. The forest dwellers will not have that right away. Once, the MSP system gets established for non-nationalised MFPs, tendu leaves and bamboo should also be de-nationalised,” he added. However, it has to be seen whether states would be willing to relinquish control over this lucrative trade and what the tribal affairs ministry does to get the tribal people and forest dwellers their rights.